A chartered accountant, by definition is a professional member of the national professional accounting body of the country, and in the case of India, this professional accounting body is the Institute of Chartered Accountants of India (ICAI). What is the work of a Chartered Accountant? Chartered accountants work in the field of business and finance and their job encompasses areas like audits, taxation, company law, financial accounting, financial reporting, corporate finance, business recovery and insolvency, accounting systems and processes, and general management of the company. Regular management and review of company’s financial systems and budgets and analyzing risk. Conducting financial audits to check the financial position of the company. Providing financial advice wherever needed in relation to tax planning, tax issues, mergers and acquisitions, business transactions, business improvement, issue of insolvency, etc. Forensic accounting, that is, detecting and preventing fraud. With the liberalization of the Indian economy, many a businesses have cropped up in the country over the last few decades. The financial market has really opened and expanded drastically and, if one is to go by the Goldman Sach’s report, then India is one of the four BRIC nations touted to be the superpowers by the year 2050. As such, the capital and money market in India is only expected to grow bigger and better in the coming years. The scope of a CA, given this scenario, is only expected to grow more and more. The job of a chartered accountant can be extremely demanding and busy, depending on the area of his work. For example: in a given day, an auditor / accountant will be busy with analyzing the financial data of the company and highlighting errors and misstatements, if any, in the books of accounts and preparing reports for the same to help the management in decision making. A tax accountant will be occupied in researching for means and ways to save the company’s tax through legal tax saving methods. He would also be busy with filing for income tax returns, and this workload increases tremendously as the income tax deadline approaches closer. What must be remembered is that even though the idea of working as a CA looks very rosy and comfortable, however, it is a common fact that many thousands of students struggle to qualify the CA exam each year, while many other qualified CA’s lead extremely miserable and depressed lives because of a disconnect with the work that they are doing. 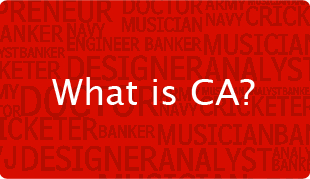 If not CA, then what else?